an unfortunate blunder with the knife, resulting in the death of a wounded soldier, ended his medical career ingloriously. arrived at the conclusion that the reason why amphibious animals have the power of living under water, and terrestrial animals have not, is because in the former the “oval hole in their hearts” remains patent [open], whereas in the latter it closes from disuse. The ‘oval hole’, known as the foramen ovale, is an opening between the left and right atria of the heart. This is one of two temporary channels (the other being the ductus arteriosus, between the aorta and pulmonary artery) which are a feature of the foetal circulation. When a foetus is still in the womb it has no need of its lungs, since the blood is oxygenated by the mother via the placenta. The ductus arteriosus and foramen ovale allow most of the circulation to bypass the lungs during gestation; they usually close naturally at birth or shortly afterwards. If by any means this foramen ovale could be prevented from closing, then he should expect that animals which now live on land only would be able to acquire aquatic habits also; for the blood which passes through the lungs while the animal is on land would be able to circulate from right side to left through the “oval hole” when they were below water. By means of this perpetual aperture…these animals have the advantage of breathing or not at pleasure. Buffon believed that diving mammals were able to stay underwater for long periods because their blood bypassed the lungs while they were immersed, allowing it to circulate while holding their breath. He was completely wrong: the muscles of such animals (and diving birds) have very high levels of a protein , myoglobin, which stores large amounts of oxygen, and which is found in relatively small amounts in human tissue. Dr. Schultz resolved to experiment. Having some new-born setter puppies, he within an hour after birth immersed them in water heated to blood heat, and kept them under first for two minutes, subsequently for five minutes; and, finding that no unpleasant consequences followed, he soared to the determination of experimenting upon his own infant son. Or, to put that another way: having narrowly failed to drown a litter of puppies, he resolved instead to drown his newborn son. Just after it was ushered into the world he immersed his child in a pail of water heated to blood-heat, and kept it below the surface for four minutes. After twenty seconds the blood of the infant “found its way through the oval hole of the heart.” The experiment was daily repeated—sometimes as often as five times in the twenty-four hours,—until the child was able to remain with comfort and safety under the water for twenty-five minutes at a time. A quite astonishing display of parental idiocy. It is, of course, entirely implausible that the baby survived underwater for anything like this length of time. 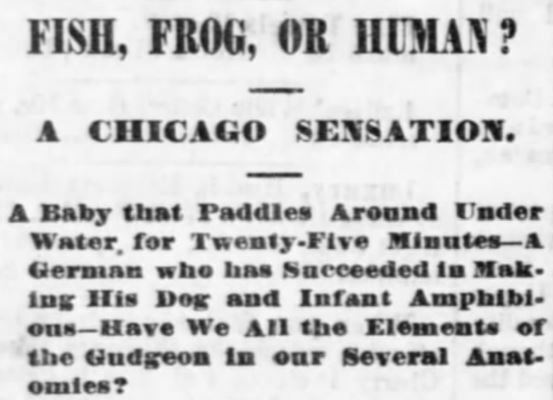 The Chicago Times published a rather more detailed account of this appallingly reckless experiment: One rainy, windy night, Louis Shultz, Jr., was ushered into the world. The midwife was dismissed as soon as convenient. The child was, if anything, small and delicate. The exhausted mother was now sleeping; all attendants had gone, when Shultz, pale and agitated, at two AM. on the morning of Sept 20th, proceeded to execute his unnatural resolution. Stealthily be took the babe from the bed of the young mother, and in an adjoining apartment rapidly undid the work of dressing the infant, which had been carefully accomplished but half an hour before. Water, heated to about blood heat, was placed in a common tin pail; the reckless father laid his open watch on the table in front of him, and without hesitation immersed his infant with his own hands for the space of four minutes, keeping one hand on the babe’s breast, so that the pulsations of the heart could be felt. Shultz stated that it was more than twenty seconds after immersion before the blood found its way again along its old channel, with a bounding percussion which startled him with its power, while it relieved his anxious suspense. Feeling, then, the apparently natural beating of the heart, he had no more anxiety, but upon removing the babe from its dreadful situation, it was ten seconds before the lungs resumed their duties, and the circulation proceeded in the natural manner. If this wasn’t bad enough, it transpires that Schultz/Shultz was doing this without the knowledge of his wife. During the ensuing day this thrilling experiment was repeated no less than five times, the father always seizing the opportunity when the child awoke crying to take him into the other room for the ostensible purpose of wishing to look at and pacify him, but in reality to renew his hazardous experiment. Unsurprisingly, she was not thrilled about it when she found out. It was not until his wife was able to leave her bed that Shultz found it necessary to acquaint her with his proceedings, and he then informed her as delicately as he could, assuring her there was no danger to the child, but a certain fortune for them if she kept the matter a secret. But poor Mrs. Shultz could not understand it, and it is not surprising that the shock occasioned by this unheard of intelligence prostrated her again for nearly two weeks. 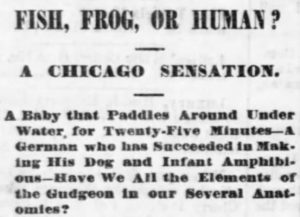 In spite of the severity of the winter, Shultz never neglected the regular immersion of his child five times a day, for periods of time ranging from 5 minutes to, on one occasion, 25. On this latter occasion considerable maceration was observed, and immersion for so long a time was not repeated. The boy is a golden, curly-haired, blue-eyed little fellow, and exhibits physical powers uncommon in a child of his age. His flesh is hard, white and shining, and the writer was assured the infant was entirely free from the peevishness and fretfulness common to children of that tender age. A room is fitted up especially for him, containing a large bath tub, with a thermometer suspended in it, and the writer was allowed to witness his immersion. The father slated that very often he would voluntarily enter the water, but usually they were obliged to resort to some compulsion. The bath was prepared and the child undressed, when the father dropped his knife into the bath and asked the child to go and get it, at the same time placing him upon the edge of the bath, with his chubby little legs in the water. The child plunged in at once, and appeared to have much better control of his movements in the water than out. He soon handed the knife to his father, although the water was fully three feet deep. Five or six white peppermint lozenges were then tossed in different parts of the bath, in pursuit of which the child eagerly went, and he was fully three minutes under water endeavouring to secure them, as he dropped them again almost as fast as he picked them up. Finally he turned up head first, and held out his fat little hands, filled with the candy, appealingly to be taken out. The writer seconded his appeal, fully satisfied there was no humbug in regard to his amphibious faculties, and heaved a sigh of relief as the youngster was dried and again dressed like ordinary babies. One can sympathise with the journalist, who must have thought he was in the presence of a maniac. Mrs Shultz, although now satisfied there is no danger to be expected from the treatment of her child, is by no means reconciled to it, and expressed the belief that when the affair becomes public, her husband will be prosecuted and imprisoned for his unnatural conduct. Schultz, on the contrary, considers that he is doing humanity a service by initiating a practical and certain method of obviating all danger to human life by drowning; and asserted his belief that the day is not far distant when the acquisition of this amphibious faculty will be as prevalent a practice as vaccination is now, and will be made compulsory, if necessary, by law. What a prophet! Strangely this prediction has yet to come to pass. The editor of the Medical Notes and Queries plainly thought the whole thing was ludicrous, and concluded his response with a withering lesson in basic physiology. Before the practice of attempting to render children amphibious becomes as “common as vaccination,” it would be as well if those who would essay the feat were informed that the blood, to serve its functions, requires to be oxygenated as well as circulated, and further, that if not oxygenated it will cease to circulate. The oval hole unfortunately provides no means for the supply of oxygen to the vital fluid. A still more important fact for such experimenters to remember is this: that should the experiment fail from any cause—and any experiment may fail at some time or in some hands—the person to whom the failure occurs will be made to compound for his want of success by a commitment for manslaughter. Sadly I have been unable to find any further trace of ‘Dr’ Schultz and his amphibious offspring. Let us hope that he was not drowned. Myoglobin is found in the muscles of pretty much all mammals. Marine mammals have a number of adaptations that allow them to dive for extended periods of time, but the presence of myoglobin is not one of them. Thanks for your comment. You’re right, I should not have written that humans ‘lack’ myoglobin – a basic error which I’ll correct. And I agree I understated the other physiological adaptations present in these species.